The Presidential Election is right around the corner. After months upon months of campaigning, the contest is finally down to two nominees and their running mates. At this point in time, it seems like the key to winning this election lies with independent voters, specifically independent Millennial voters because this year marks one of the highest levels of political disaffiliation in the United States. 1. 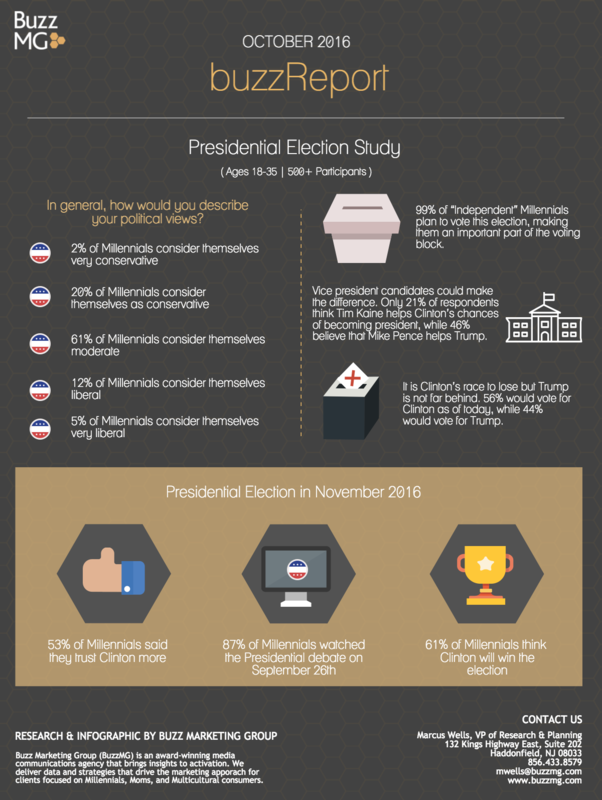 Independent Millennials will be at the polls this November. An incredible 99% of survey participants plan to vote in the 2016 Presidential Election. This is a remarkable majority, particularly because this is such a targeted group by both presidential campaigns. Given the expected turnout from this demographic, independent Millennials are sure to be an important voting block in November. In order to stay up-to-date with the election, this group is also making sure to tune in to the elections. 87% of survey respondents watched the first Presidential debate between Hillary Clinton and Donald Trump on September 26. 2. Votes and preferences are somewhat evenly split, but with a slight tilt toward Clinton. As of today, 56% of respondents would vote for Secretary Clinton while 44% would vote for Mr. Trump. When asked about specific characteristics, respondents agree that they trust Clinton more (53%); believe that Clinton would represent America better internationally (63%); think that Clinton is better at communicating her message (69%); and assert that Clinton would be more likely to improve life for Americans living in the U.S. (53%). 42% of respondents believe that Trump should win the election, while 58% believe Clinton should win the election. 39% believe that Trump will win the election, while 61% believe that Clinton will win. 3. Vice Presidential candidates could make a difference. Although vice presidential picks have historically not had a huge impact on the result of the Presidential Election, they might have a bit more of an influence during the upcoming election – particularly for Trump’s campaign and supporters. 21% of respondents believe that Tim Kaine can help Clinton’s chances of becoming POTUS, while almost half (46%) believe that Mike Pence will help Trump.